Imagine all the household clothing made from these richly earth tone late 19th century cotton calicoes. 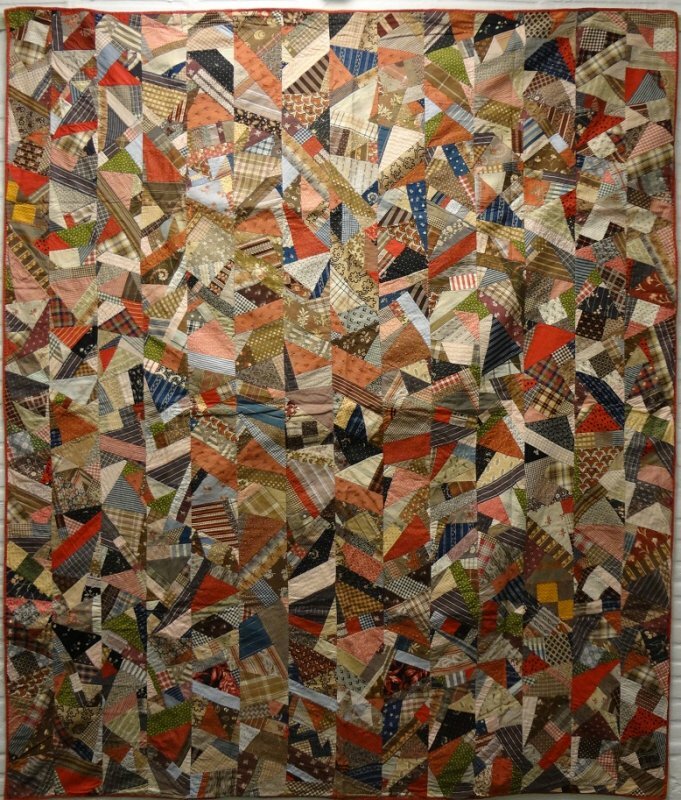 Unlike its silk crazy quilt counterpart, this example has no embroidery over the seams of the 1000 + pieces. It is so interesting to see the trends in quilt composition that were shared even in this time period, with the silk quilts embellished but usually not the cotton ones. In excellent untouched condition.For a fabric lover, modern art lover, or historic quilt lover, this great example is in super condition and contains uncounted thousands of pieces of 19th c printed cotton. You'll find favorites in documented historic prints and ones that symbolize the print technology advances of the era. Arrayed as narrow 'bars' pieced with fabric shards collected first into diamond shapes. A cotton crazy of this small scale piecing and intricacy is an eye catching find.